Turkey Tips from Grancy's Toolbox - Ham I Am! Q: What size Thanksgiving turkey do I buy? A: Figure 1 1/2 lb per person on a 15-20 lb turkey.There is less meat to bone in a small turkey under 12 lbs, so figure 2 lbs per person. If you have left overs, watch our blog for recipes! Q: Do I buy frozen or fresh? Q: How long does it take to thaw the Thanksgiving turkey? A; Allow a full day per 4 lbs for thawing. So if you have a 20 lb turkey start thawing in the refrigerator 5 days in advance. Q: What do I roast the Thanksgiving turkey in? A: Use a sturdy shallow roasting pan. Once when I took my turkey out of the oven, the aluminum pan broke and my turkey juice was everywhere....and it burned! So try to get a nice roasting pan, no higher on the sides than three inches,for use year after year.....A smart investment! Q: When do I stuff the Thanksgiving turkey? A: Stuff your turkey right before you put it in the oven. Do not pack it in tightly - it expands. Cook additional stuffing in a casserole, adding turkey drippings to the casserole while cooking. Baste your turkey with a basting brush every 45 minutes. Q: How do I know when the Thanksgiving turkey is done? A: While you're purchasing your roasting pan, and basting brush, pick up a good thermometer to stick in the thickest part of the thigh (don't hit the bone). Your turkey will be ready when it reaches 165 degrees. Q: Can I carve the Thanksgiving turkey as soon as it comes out of the oven? 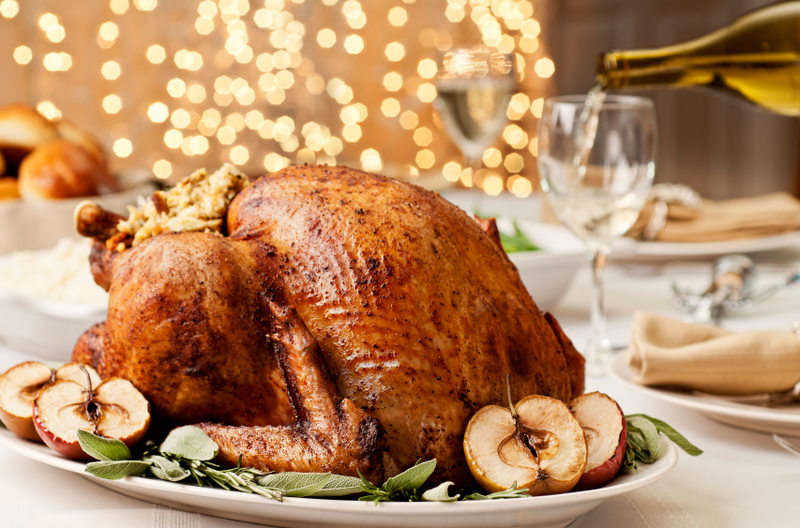 A: After you remove the turkey from the oven, remove the stuffing, cover the turkey loosely with foil and let it rest for 25 minutes before carving.This will preserve the juicyness of your turkey. One last tip: If you don't want to go through all of the above, just click HERE and order your Hickory Smoked or Peppered turkey from HAM I AM! !